When do you reach a mid-life crisis ? I the case of new cars today, about 3 years after they’re launched. A case in point is the latest Mazda3, which was updated in late 2016. So what exactly has changed ? Well, the front grille is larger & there’s a lowered badge on the more prominent grille, bringing the 3 closer in design to the CX-3. The front headlights now feature adaptive LED bulbs, replacing the old xenon units. There’s new door mirror-mounted indicators & the rear bumper has been re profiled & has some slashes in it. Inside, the changes are slightly more noticeable. There’s a new electric handbrake freeing up room for two central cupholders. There’s redesigned & better quality door trims, featuring larger more practical cup-holders. A new 3-spoke steering, similar to the one found in the MX-5 adds a touch of style & the dash mounted infotainment screen is thinner. Mazda sent Company Car the SE-L Nav model the second from top model in the range, which offers heated front seats, Smart City Brake Support (SCBS), front rain sensing wipers, dusk-sensing headlights, LED front fog lights, rear & rear side privacy glass windows, rear parking sensors, heated (3-stage) front seats, cruise control with manual speed adjustment, dual-zone climate control ,Mazda Navigation System & an adjustable speed limiter. 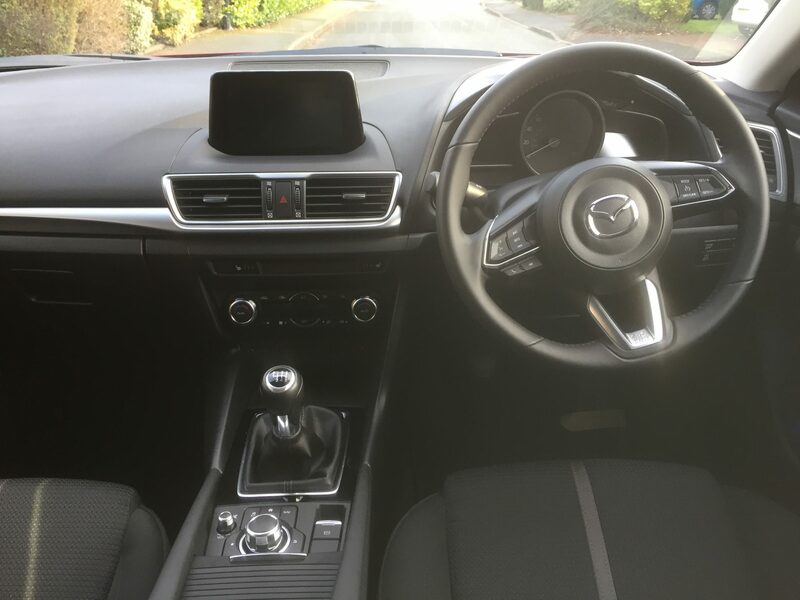 Mazda’s familiar 7” touchscreen which is mounted on top of the dash, is very user friendly, with access also offered through a rotary controller on the transmission tunnel. In the driver’s seat, the circular speedo & dash-board controls are all clear & fall easily to hand. On the move, I selected both the DAB radio function for my beloved 6Music & also connected my i-Phone music, both via Bluetooth & with a USB cable. Hands-free calls are simple to negotiate as well. Mazda’s own SatNav is another winner allowing you to scroll out to see if there are delays ahead with relative ease. The new-improved interior definitely feels more upmarket, not just over the Mk1 Mazda3 but also over the other mainstream Japanese brands.The Mazda though, can’t quite match BMW or Audi for upmarket appeal, but it’s pretty close to the quality found inside the Mercedes A -Class. Powered by the fleet-friendly 1.5 105ps diesel engine, my test car felt quite sprightly, even with four adults on board. There is an argument to go for the larger 2.2 diesel, or even as they come into vogue, the 2.0 litre petrol version. Having tried both whilst the 2.2 diesel is nippy, it can’t match the 99g/km of CO2’s on offer in the 1.5, whilst the 2.0 litre petrol version, gave me a rather disappointing 41.2mpg on the combined cycle, with the 1.5 diesel giving me a much better 51.6 mpg. 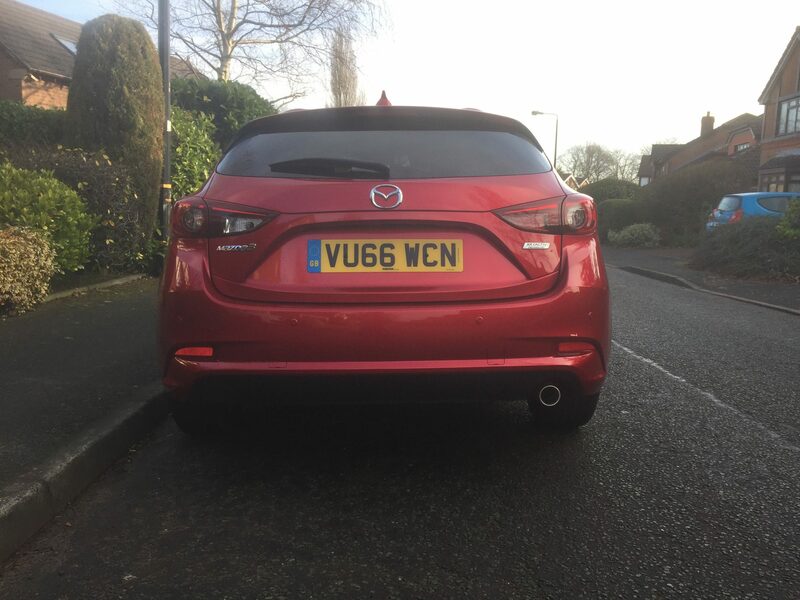 The Mazda 3 hatchback is 4,465mm long & 1,795mm wide, but the cabin although roomy up front – leg & headroom have been improved over the old Mazda 3 by mounting the seats lower – is quite tight in the rear especially hard-room-wise with the 3’s sloping roof the culprit. 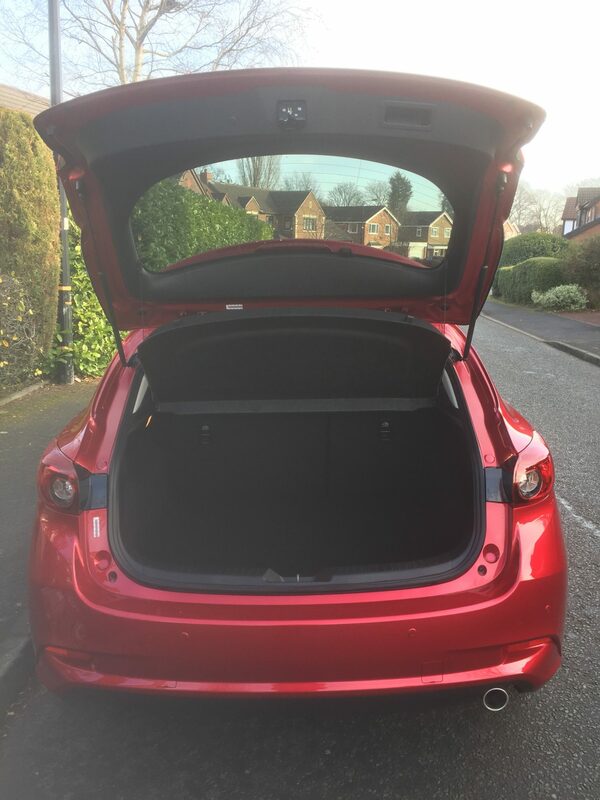 For those after boot space, the Mazda offers a 364-litre boot, which lags behind the 470 litres in the Peugeot 308, Volkswagen Golf’s 380 litres & the Vauxhall Astra’s 370 litres. When the rear seats are folded flat this increases to 1,263 litres. Driving the Mazda3 is enjoyable, thanks in the main to it’s manual six-speed gear box which makes for smooth & precise gear changes. Handling is also impressive, whether on winding country roads or when accelerating along the motorway. In town & in traffic, the Mazda i-stop system performs well, silencing the engine when required to help you save on fuel, with no discernible drag when it kicks back in again. Only small improvements may have been made to the Mazda3, but it is unquestionably better for it. The real surprise for me was just how well the small 1.5 diesel engine performed. With only 105ps on offer I thought it would feel underpowered, but I needn’t have worried. In a ridiculously competitive sector- VW have just tweaked the Golf, the Astra was our Car of the Year in 2015, the Peugeot 308 our Car of the Year in 2014- the Mazda3 is up against it. What it has going for it though is what all Mazda’s have, a kind of indescribable poise on the road, allied to top-quality build quality & great reliability. Mazda3 contract hire prices are also excellent, as I write the Mazda3 105ps SE Diesel can be had for just £179 per month + vat, whilst the Mazda3 120ps SE petrol is on offer from just £169 per month + vat, both on 6+35 contracts over 3 years.